As an experienced architectural illustrator, my job is to bring the projects of architects, designers and developers to life visually. My original training and experience working as an architect undoubtedly gives me an advantage here. 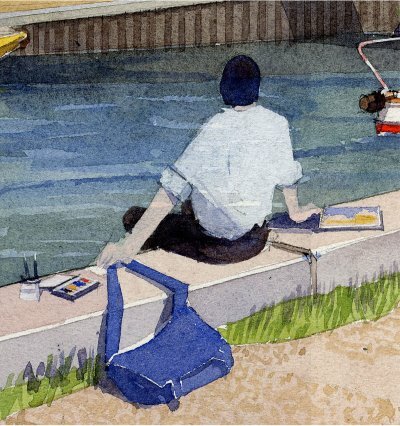 I can work from my own sketches or from computer generated information but final illustrations are produced entirely by hand in watercolour, ink and crayon. These are then scanned to provide a service that is extremely fast and quite unique. Artwork is usually completed at my Devon studio but I am happy to work on location when the need arises. My clients range from urban designers to developers, from architects to individuals and the projects I have worked on range from the Tate Modern and the House of Lords to private houses and local authority developments. I often work at the very early stages of a scheme when there is little or no information and am used to collaborating with the design team, sketching on-the-spot that allow us to move quickly through ideas and viewpoints before deciding on the final image. This kind of work is becoming highly specialised, being particularly suited to public consultations. I have enjoyed successful long-term working relationships and friendships with many clients over the years. Please contact me directly if you have a project or idea you would like to discuss - I look forward to hearing from you.